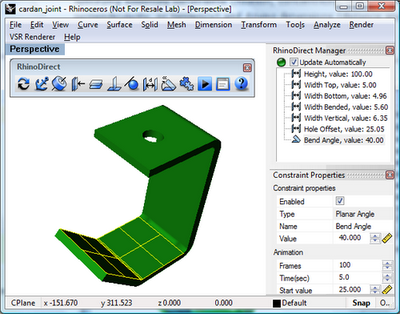 Novosibirsk, Russia, January 4, 2010 - LEDAS Ltd., the independent provider of variational design tools, technology components, and software development services for the CAD/CAM/CAE/PLM market, today announced the public beta release 0.1 of its new product, RhinoDirect. This new plug-in for Rhinoceros 3D modeling software by Robert McNeel and Associates is built on the functions provided by the RhinoAssembly plug-in released last month by LEDAS. The version 0.1 of RhinoDirect is available as a free download from www.DrivingDimensions.com/labs.php.